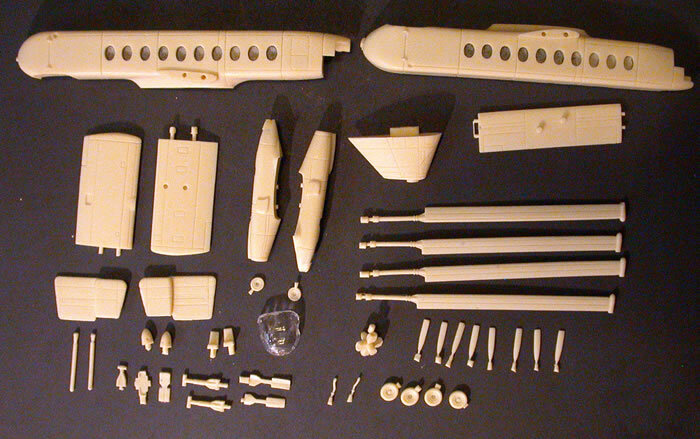 Very clean moldings; good fit; interesting aircraft; three bonus models included with Sentinel kit. For the relatively small segment of modelers not irretrievably lost in events of the early-to-mid 1940s, both models will be worthwhile and interesting subjects. Recommended. Various plastic kit iterations of the distinctive (and now retired) F-117 “black jet” have existed for decades (most in 1/48), including at least one fanciful release before the public ever got to actually view the real deal. 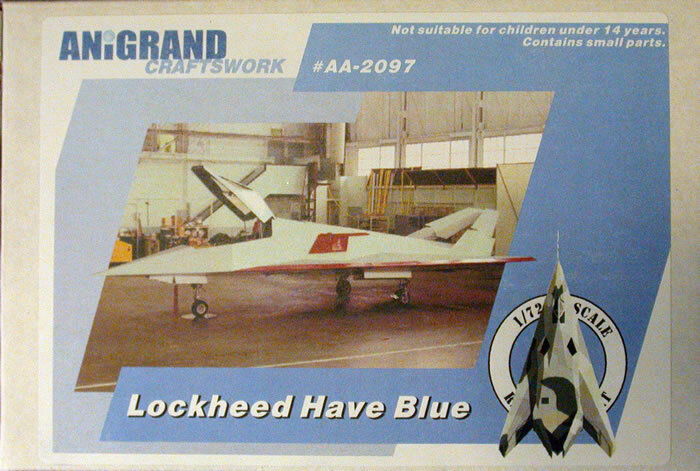 Now, courtesy of Anigrand’s eclectic lineup of subjects, modelers have the opportunity to build the black jet’s equally secretive progenitor, “Have Blue”, a 60%-of-full-scale, flyable, proof-of-concept article, two of which were built. 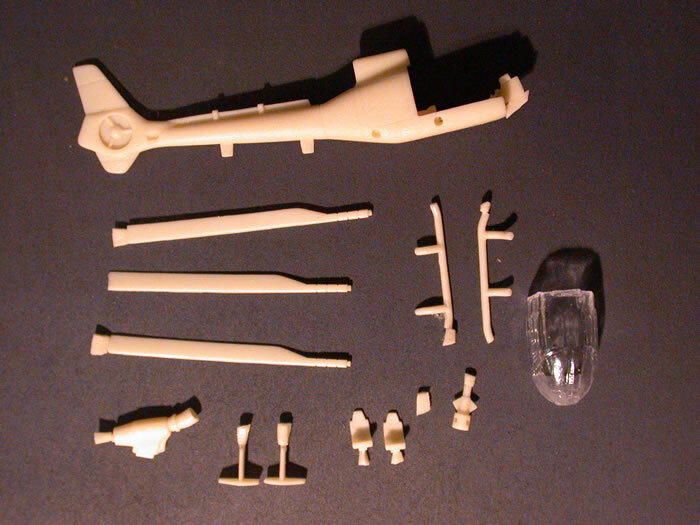 In 1/72 the small airframe (in an already small scale) is, as one would expect, very simple; no more than fifteen parts comprise the whole shootin’ match. Very clean and smooth; essentially no flash, even on tiny, intricate pieces such as gear struts/wheels (which are integrated), and just a few small pour gates that will need to be Dremelled off. 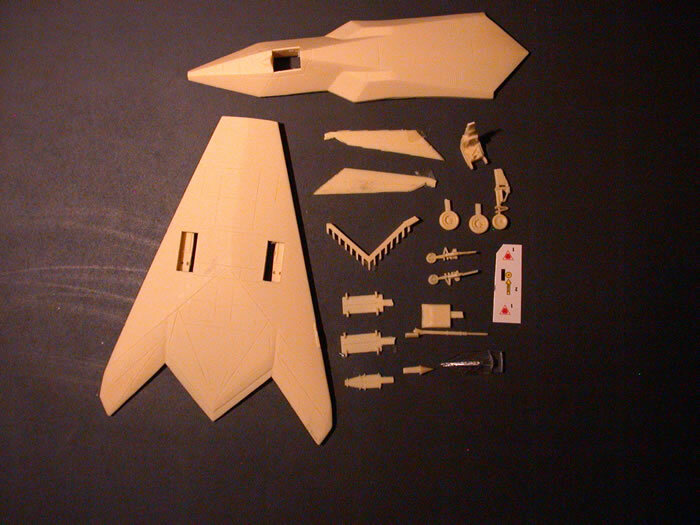 The two main components, top and bottom airframe pieces, fit very well, with a minimal seam. All other components are plug in or edge-glued (gear bay doors, exhaust “grill”). Anigrand recognizes very minor equipment differences in the Number One and Two airframes and includes applicable parts and notes in the instructions. Only a seat is included, but it has belts molded in. A tiny one-piece clear resin windscreen/canopy is all she wrote. I believe in this scale I’d configure the cockpit closed. Two ejection seat warning symbols and an emergency canopy opening stencil are it; the real deal had no markings. As I’ve already intimated, assembling this kit is not exactly rocket science. The modeler gets a single, B&W, “traditional” Anigrand instruction sheet, including the pattern for the unusual Black, Grey, Deep Gray and Tan cammo scheme (FS numbers included). If you’re a dyed-in-the-wool 1/72 believer, you’ll want this highly unusual airframe to supplement your Black Jet; you do have a Black jet, don’t you? Bondo approves! And now, boys and girls, we go even smaller, to the seemingly sub-atomic-but-ever-growing- world of the 1/144 aircraft model. To Anigrand’s extensive, wonderfully varied list of releases comes an airframe of which Bondo admits little prior knowledge. Essentially, Bombardier (of snowmobile fame, I’m guessing) has modified five of its large Global Express biz jets in accordance with the U.K.’s ASTOR (Airbore Stand-Off Radar) Program, a ground surveillance (read “enemy ground forces”) scheme. 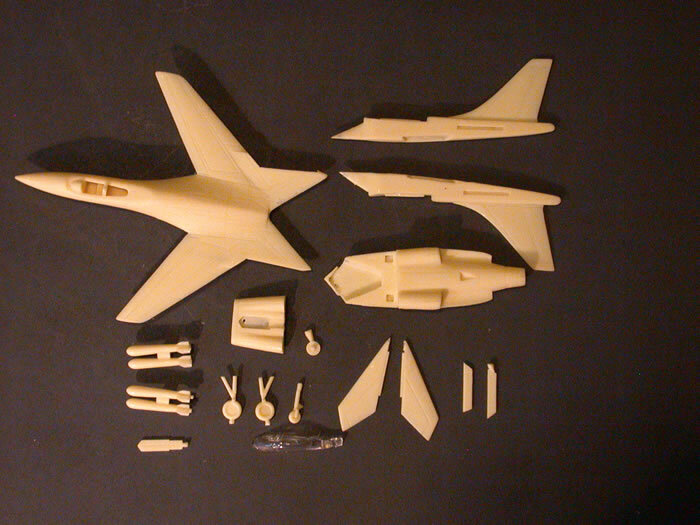 Even for a large jet (in real life), when 1/144 enters the picture, parts get fewer and fewer: fuselage halves, engine halves, three-piece tail and one-piece wing halves. 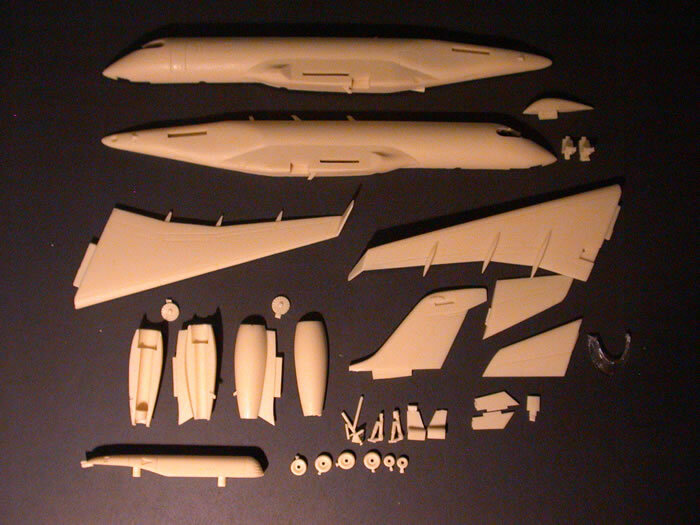 No more than twenty remaining small, some VERY small, parts and two electronics fairings (one is large). I appreciate that Anigrand cast the large flap hinge fairings integral with the wings; no delicate placement and glueing required. Very clean and smooth overall with the exception of some resin “crud” around windscreen cutout/instrument panel coaming that will need careful cleanup. I do wish Anigrand would do the front of engine pods as one-piece, vice the troublesome “halves” concept (which often requires extra sanding and filling). I plugged in the wings and tail components, and all fit with essentially no visible seam. Rudimentary in this scale (and with such a small, thick windscreen, components are not really needed); the instruction sheet neglects to show it, but there are two seats which plug in to the cockpit floor. As I’ve already mentioned, the windscreen cutout will need some cleanup, as will the aft ends of the clear resin windscreen itself. Very small struts and wheels are separate pieces, so put on your Opti-Visor, ‘cause cleaning up the tiny pour gates, etc. is going to require mucho visual acuity. Twelve tiny items to affix, the largest being the horizontal tail stripe w/logo. Again, typical Anigrand B&W, one page, with color and decal callouts. 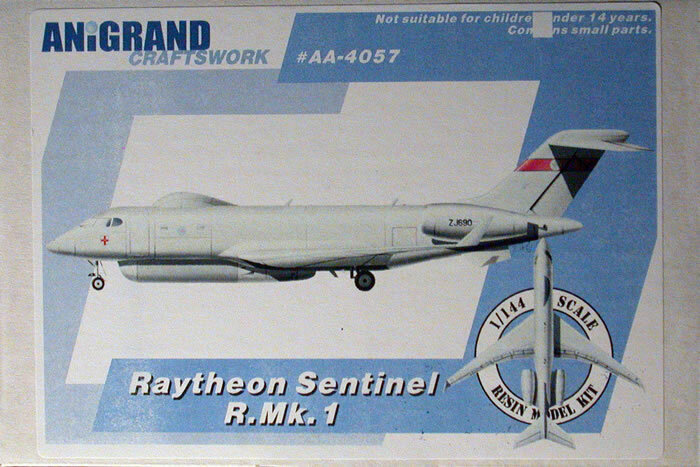 For the relatively small segment of modelers not irretrievably lost in events of the early-to-mid 1940s, the Sentinel will prove an interesting and current subject. Recommended. To this curmudgeon’s knowledge, Anigrand is the only model manufacturer that includes additional, often-highly-eclectic aircraft subjects along with a kit’s featured 1/144 airframe; a nice touch IMO. All three mini-kits are as complete and well-molded as the featured subject, and, again, you’re going to need the ol’ Opti-Visor for most of the assembly, especially the Hawker and Gazelle, which, in an aerochine kind of way, remind this grandfather of playing tiny “Hot Wheels” with his three young sons back in the early 70s. I tried the fit of various main components of these tiny subjects, and it’s a good as that of the larger subjects; ditto for the molding quality. Speaking of larger subjects, the Rotodyne actually approaches the Sentinel in size. 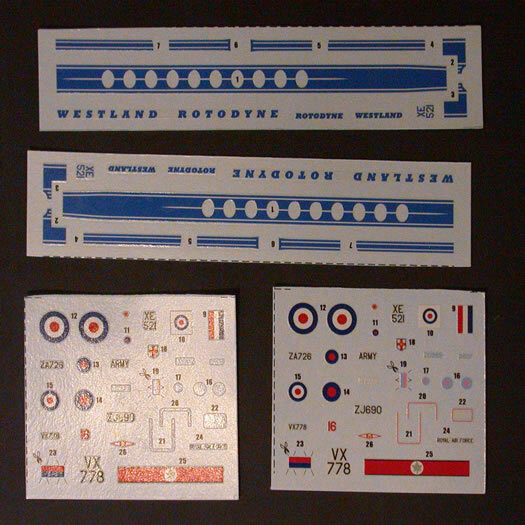 Appropriate decals for all are included, and the instruction sheet shows color references and decal callouts. Mucho gracias to Jeff Garrity at Rare-Plane Detective who provided sample kits for this review..